Happy March everyone! 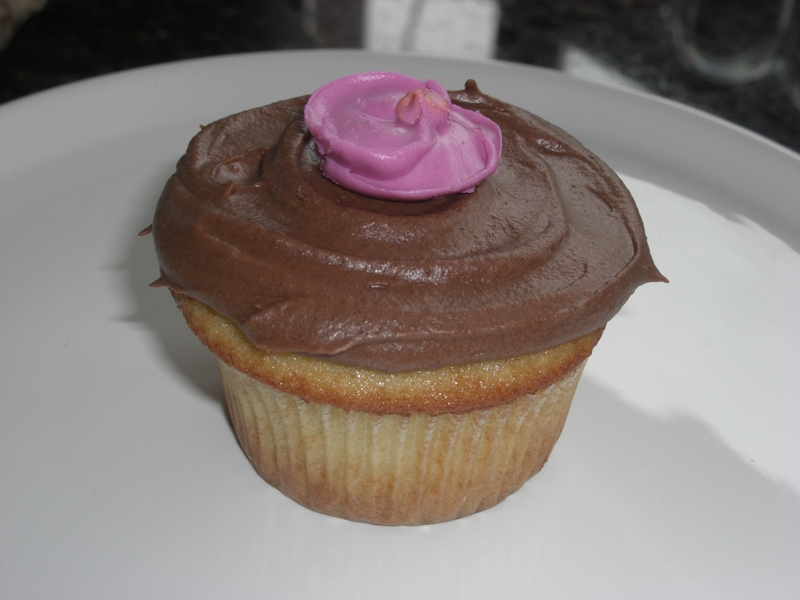 I’m here to celebrate with cupcakes – the very best vanilla cupcake recipe, all buttery and sweet with chocolate buttercream made using cocoa, which gives it the best flavor. It’s almost milk chocolatey but just a bit richer. And what’s better than a cupcake? 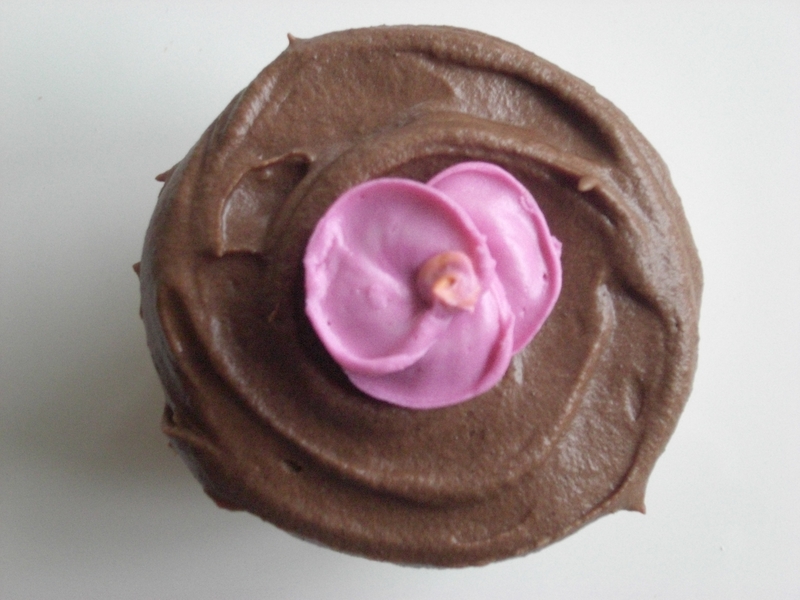 A cupcake with a flower on it. Hopefully we will be seeing some real flowers soon. But for now, the sugary kind will do. 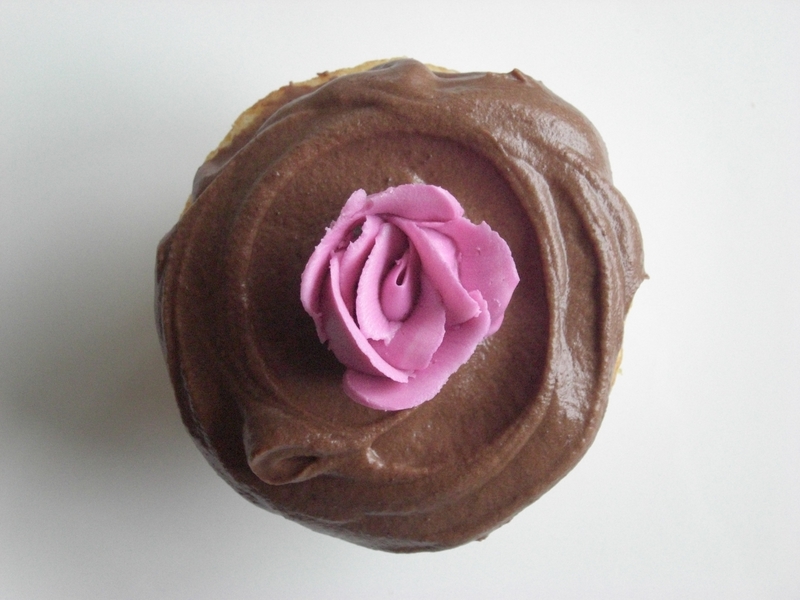 For instructions on how to make lovely icing flowers, I recommend this video. There are so many instruction videos on buttercream roses on youtube. You can become a pro in no time. 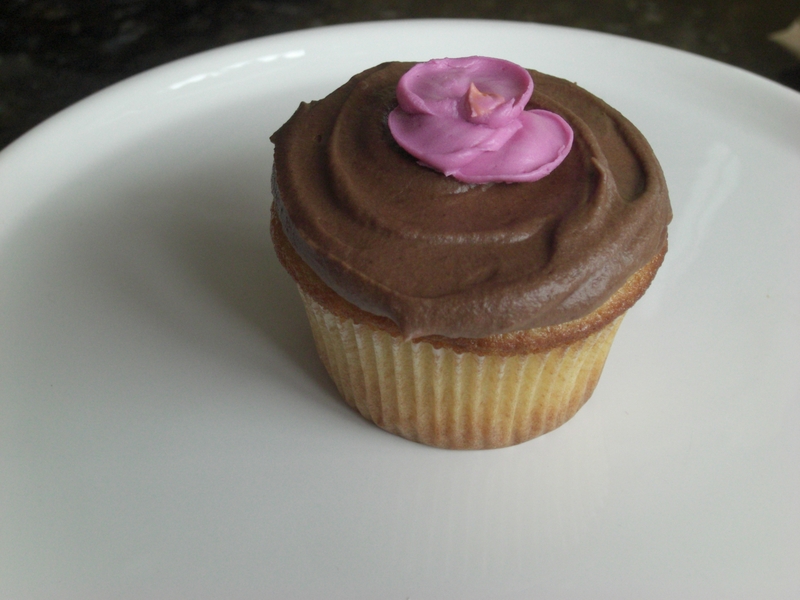 I really have to stress the deliciousness of the chocolate buttercream frosting. It’s amazing to the point where you will wonder how you are ever going to frost all the cupcakes you’ve made without licking the bowl clean. Just keep in mind the thought that frosting “makes me so sick if I eat too much.” Hopefully that will keep you in line…who are we kidding. Just enjoy it. Preheat oven to 350 degrees. Line two muffin tins with cupcake papers. In a large bowl, cream together the butter and sugar. Continue to beat until fluffy. Add the eggs, one at a time and beat well after each addition. Add the flour in three parts, alternating with the milk and vanilla, ending with the milk. Do not overbeat. Scrape down the batter in the bowl with a rubber spatula, making sure all batter is incorporated. Carefully spoon battter into the cupcake liners, filling them about 2/3 full. Bake for about 20–25 minutes- insert a cake tester, and if it comes out clean cupcakes are done. Do not overbake! Cool the cupcakes in the muffin tins for 10 minutes. 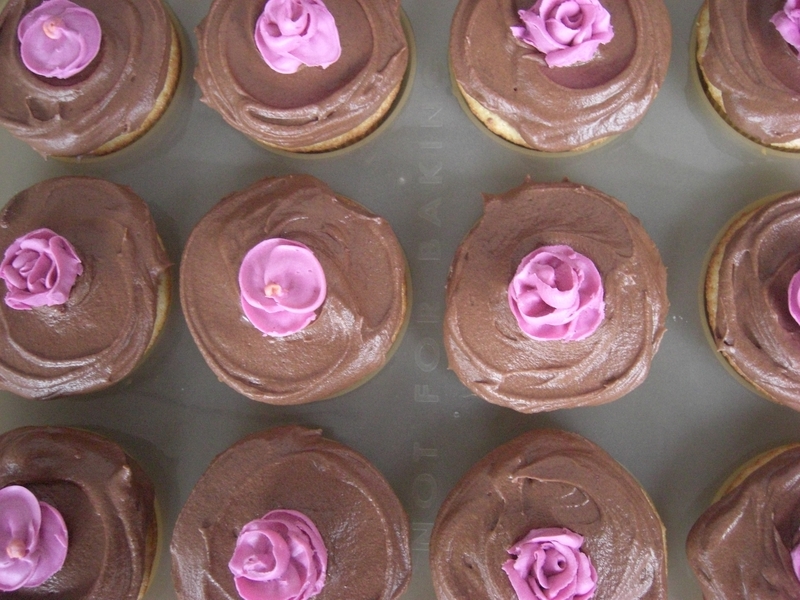 Remove and let cupcakes cool completely on a wire rack before frosting. For the frosting, cream the butter on low to medium speed in a medium bowl. Combine the sugar and cocoa and add to butter. Whip until combined. Starting with about 2 tablespoons, add milk to butter mixture slowly, until you reach desired spreading consistency. Add by tablespoons. Spread onto cooled cupcakes. You can also use a pastry bag to frost cupcakes. 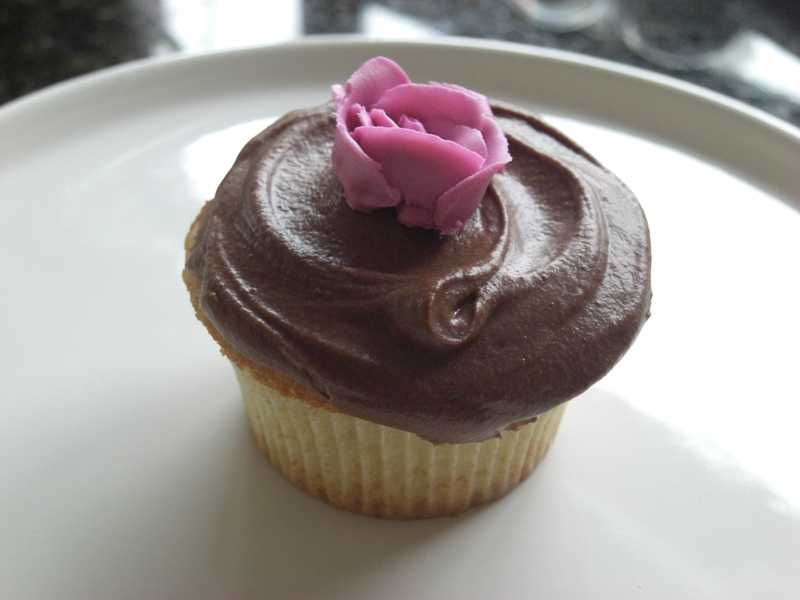 I love that frosting……and the flowers are so cute!